When speaking publicly, it's certainly handy to be able to show a live demo of a smartphone or tablet, on the projected image. It's also best to not have to assume anything about the facility you'll be presenting at, if possible, relying instead on USB cables that'll also serve to keep your gear charged. These 2 Windows products can both accomplish live video of your gadget's display right on your Windows desktop, but there are some notable differences, and neither does remote control. In other words, you're still doing all the swiping and touching demonstrations from the attached device, rather than from Windows. Yes, that means mouse clicks on the PC don't do anything to the attached device. You can see these two products demonstrated in the accompanying video below. I'll be using this software for a live demonstration of OpenVPN at a conference this week actually, at the lovely Microsoft NERD facility. It has very nice 1920x1080 projectors. But if you're presenting, keep in mind you'll want to rehearse with your laptop resolution set to 1024x768 resolution, since that's still the most common native resolution of the projectors out there. It's rare any facility operator or conference organizer will tell you for sure the specs of the projector you'll be getting, so be prepared to tinker with screen resolutions and device scaling settings, as needed. 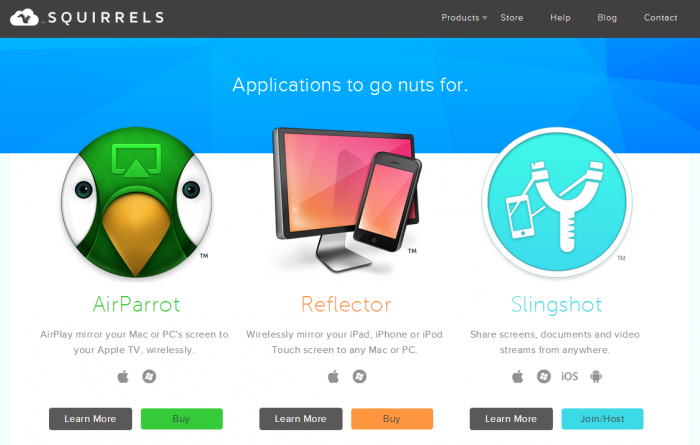 Wirelessly mirror your iPad, iPhone or iPod Touch screen to any Mac or PC. 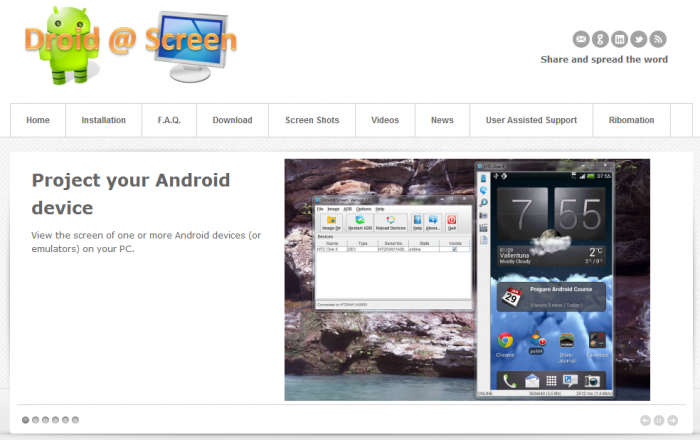 Project your Android device View the screen of one or more Android devices on your PC. 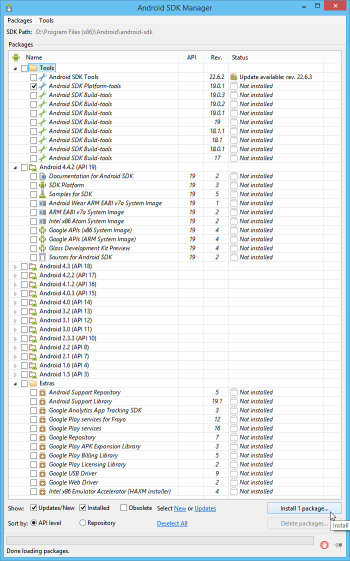 I tested these 2 Windows software packages on 2 devices, an Apple iPhone 5 running iOS 7.1.1, and a Nexus 7 running Android 4.4.2 (Kit Kat). Both were attached to the same tZilla (ThinkPad W520) simultaneously, as pictured below. Reflector has a smooth sizing mode, where you can choose any size you'd like, and it seems to handle the onscreen font resizing quite well. Droid @ Screen can only change resolutions in rough increments (50%, 75%, 100%, etc). For some reason, even though 1 to 1 pixel mapping is best for rendering of onscreen fonts and clarity, I couldn't get the 1136x640 iPhone 5 to show alongside the 1280x768 Nexus 7 with both set to 1 to 1 pixel mapping (Nexus 7 shows way bigger, for some reason). I'll have to work on that some more, rehearsing at the 1024x768 that most projectors natively handle, to see how well it's likely to turn out for the audience looking at a projected image. Yes, font sizes will be small, so I'll make adjustments to the gadgets' font sizes where possible. Reflector has automatic rotate, that is, you rotate the orientation of the iOS device, and the onscreen display rotates quickly, automatically, appropriately. Droid @ Screen has a rotation feature that you manually trigger on the Windows UI. It's my understanding that competitors in the Android space do not auto-rotate either. Reflector was a very simple installation wizard, then you just swipe up on your iOS 7 device, then choose your computer as the AirPlay enabled device you mirror your screen to. Super easy. 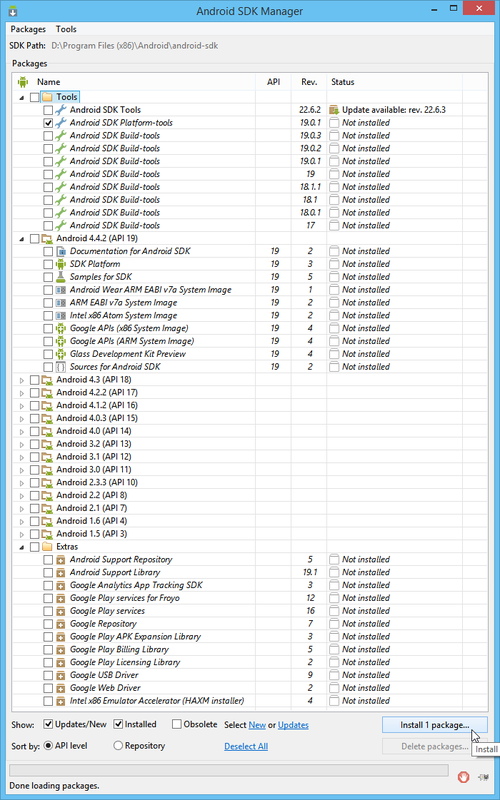 Droid @ Screen has a rather arduous installation and configuration procedure, consisting of many steps on both the Windows PC and the handheld device. It took me about an hour of tinkering to get it all going, with about 80% of what you need to know written up on the Installation page. It's not rocket science, but it's not really "fun" either, given the third party requirements that include Java and an SDK, and the application itself is actually a JAR file you click on. A bit clumsy. c) finally, if you find it stops working for mysterious reasons one day, you may also need to follow this tip to be sure you're in Camera (PTP) mode. This happened to me after months of successful use, not sure how it got set back to MTP mode. Robomation Droid @ Screen is free. Winner is Reflector for the performance and easy install, and Droid @ Screen for price. We are all winners, since each product works well enough for presentation and video production, particularly if you're not trying to show off any streaming content on the devices. It's best to not have to assume anything about the facility you'll be presenting at, if possible, relying instead on USB cables that'll also serve to keep your gear charged. Keep in mind that for Reflector to work, both your iOS device and your laptop must be on the same WiFi network, which can be a big problem in some venues. I sure wish tethering via USB cable could be used as an alternative for Reflector, but alas, that's just not the way Apple's AirPlay works. Droid @ Screen does not have this limitation, and uses the USB cable for all video mirroring to the attached PC. Let us know your experiences with these products, or similar products, on the various hand-held devices you own. 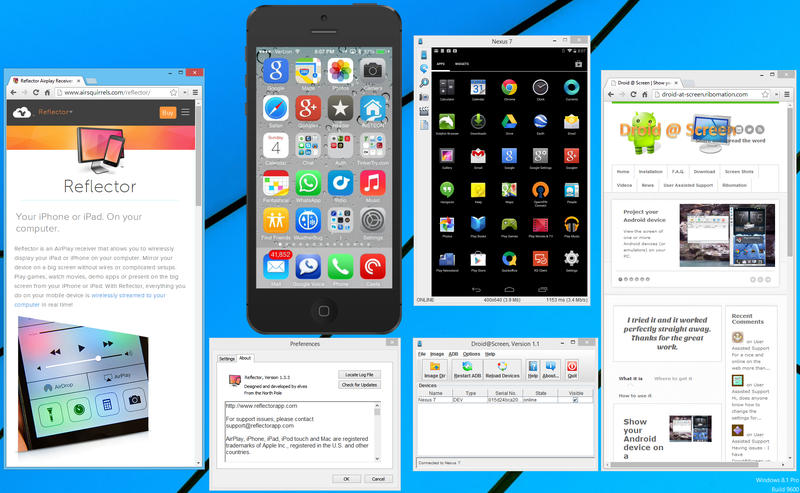 Display your iOS and Android devices on Windows, using Reflector and Droid @ Screen. Here's my quick 4 minute appearance on Home Tech Tips, "Android and iOS Display Tips for On Screen Presentations in 4 Minutes on Home Tech Tips" featuring Windows Phone too! 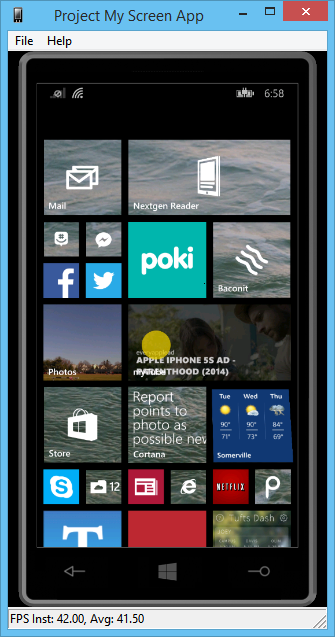 If you're a Windows Phone 8.1 fan, you'll no doubt appreciate the Project My Screen App for Windows Phone. Uses USB, and has super fluid motion on screen and on PC screen, with no lag, and extremely impressive frame rates. Even on an HTC 8x. Even better, it shows the PC window watcher where you're touching the screen (yellow circle, seen below)! If you run into any issues, this article should help. Good news, Squirrel Reflector is now available for Android, through the Google Play store. It's an AirPlay receiver for your Android device, letting you show your iOS device display right on your Android device's screen. Squirrel Reflector 2 has been released, with greatly enhanced iPhone 6 Plus support. The built-in video recorder records iPhone 6 Plus (set to optimized for high DPI mode) at a crisp 1920x1080. The catch is that the upgrade cost is $9.99 USD, through April 22, 2015, using the discount "RF2UPGRADE" code the above link automatically applies.